Like most other locations on the East Coast, Bures constructed defences in the event of an invasion by Germany. The main workforce in the construction of pill boxes seemed to be a travelling gang of irish labourers. Locally some of the boxes were constructed by Henry Everett & Son, a Colchester based building company. All the Pill Boxes were all constructed in the 6 month period June to october 1940, a remarkable achievment. The majority of defence works were built to resist invasion chiefly by an army equipped with armour and artillery. In 1940 it was considered the most effective method, was through using defences that made use of the natural contours of the land. 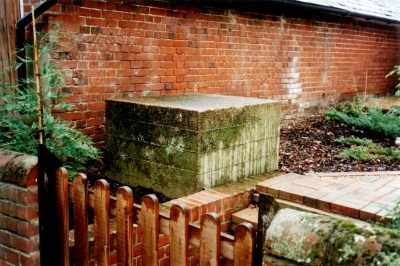 Pill Boxes were by far the most common of all defence structures, they were only meant to be a delaying tactic until further army units could arrive to support the local force. Today, little evidence can be seen of this work - except for the `Pill Boxes` along the river bank. These defence structures are listed by Essex County Council on their Heritage Web Site for Bures Hamlet. There appears to be no records of any Pill Boxes on the Bures St Mary side. They all appear to be on the west side of the river, consequently all in Essex. 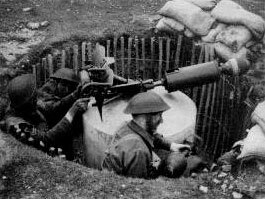 Records state, 2 spigot mortar positions, Secretaries Farm, S.E. corner of grass field N. of and adj. stackyard. This second emplacement still survives. It stands as an 18 high pedestal, surmounted by its stainless steel spindle, at the SE corner of a large arable field a few yards W of the public footpath. Around the pedestal is raised earth; it is not known if ammunition alcoves survive below ground level. Example of Gun Emplacement, some were below ground as shown, others were at ground level protected by concrete walls. (destroyed) Records state, "2 spigot mortar positions, Secretaries Farm, a) Adj. wall next to front entrance. 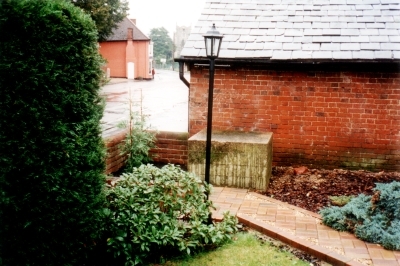 The front entrance of Secretaries Farm was on the corner of Station Hill and Water Lane. It has now been moved down Water Lane. Nothing more is known of this emplacement. Road Barrier. Station Road, Bures. 8 concrete cubes & sockets for angle irons. Secretaries, Bures. Front entrance. This road barrier crossed Station Hill, not Road, between No. 3 (now known as Coppers) on the S side and Secretaries Farm on the N side. On the S side one concrete block still remains, 36 square, standing close to the front wall in the garden of No. 3. The front entrance of Secretaries Farm was on the corner of Station Hill and Water Lane. It has now been moved down Water Lane. As the road barrier on Bures Bridge guarded against attack from the E and the one across Colchester Road defended the town against an advance from the S, so the road barrier across Station Hill blocked the approach from the W.
(destroyed) Road Barrier. At Bures Bridge. 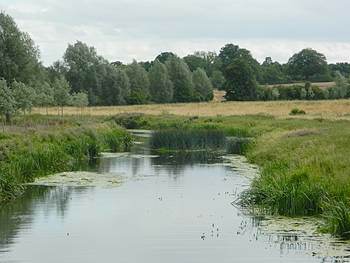 (River Stour). No trace of this barrier now remains. Road Barrier. Adj. Cambridge Brook, Bures. This is where the anti-tank ditch of the Eastern Command Line at this point Cambridge Brook crossed Colchester Road. 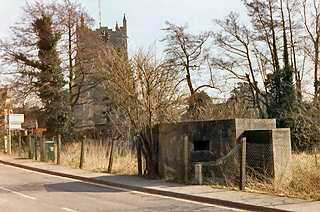 30 yards from Bures Bridge, at the side of a field close alongside the pavement, is an FW3/22 concrete pillbox. pieces, and an entrance on the SW face. W of River, S of Village Pill Box (destroyed) 2 pillboxes & deposit of silt from river dredging, between R. Stour & Colchester Road. An aerial photograph taken in 1946 shows the indistinct shape of a pillbox, at the N end of field, by the W bank of the R. Stour. Nothing now remains. NW of Cambridge Brook/Colchester Road road Barrier, Bures Pill Box (destroyed) Pillbox. Between railway line & Colchester Road. An aerial photograph taken in 1946 shows the indistinct shape of what is probably a pillbox standing on the SW side of Colchester Road at this point some 60 yards NW of the Cambridge Brook/Colchester Road road barrier Its type cannot be determined. Nothing now remains. E of Crossing Mount Bures Pill Box (destroyed) A/T ditch, clearing of bank & pillbox, N.W. of Rectory & adj. railway. 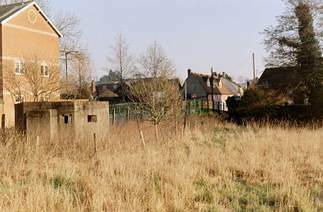 Aerial photographs taken in 1946 and 1949 show this pillbox or its remains standing immediately to the E of the road junction about 40 yards E of the level crossing. The pillbox type cannot be determined. Records state, 6 concrete pimples. Builders Yard & premises, Colchester Road. The builders yard was on the W side of Colchester Road immediately S of the road barrier. The area is now no. 12 Colchester Road. The pimples were probably an extension of the road barrier. 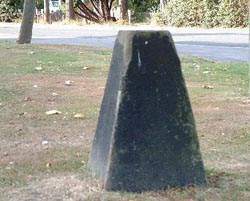 Example of tank trap - many of these concrete cones would have formed an impenetrable grid type network across a road or access. (destroyed) Records state, Spigot mortar position & restriction of user of land to prevent blocking field of fire. Yard to N. of Old Gas Works & now used as Coal Dump, Colchester Road. The gas works stood where the petrol station now is on the E side of Colchester Road and it stretched around the back of the houses nos. 1, 3 & 5. 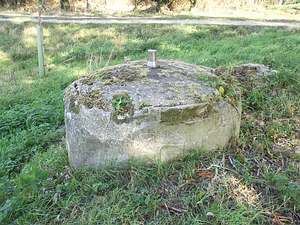 Nothing more is known of this emplacement although from its siting it is probable that it was positioned to fire on Bures Bridge. (destroyed) Records state, 4 sockets for angle irons. Cottage in Colchester Road, front garden, 3 sockets for angle irons. Rushmore, Colchester Road, Front garden and 1 socket for angle iron. Cottage in Colchester Road, Front garden. These entries refer to a socket and rail road barrier across Colchester Road between nos. 29 (4 sockets) and 27 (1 socket) on the E side and Rushmere (3 sockets), not Rushmore, on the W side. (destroyed) Records state, Spigot mortar position & hinging of portion of fence. Builders Yard, Colchester Road, S.E. corner. The builders yard was on the W side of Colchester Road, immediately S of the Road Barrier This area is now No. 12 Colchester Road.